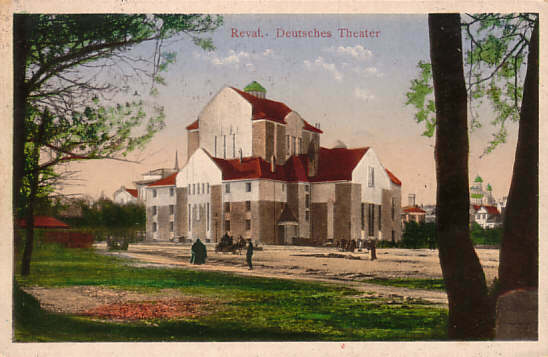 Built in 1910 by A. Bubyr and N. Vassilyev as "Deutsches Theater". Façade probably modelled after Oskar Kaufmann's Hebbel-Theater in Berlin. Home to the local German theatre company. 1939 bought by the "Eesti Draamateater" (Estonian Drama Theatre) company. 1955 and 1960 minor exterior rebuilding. 1980 major interior restoration to the original style, modernization of sound and light systems. Main Hall: 548 setas, Small Hall: 145 seats. 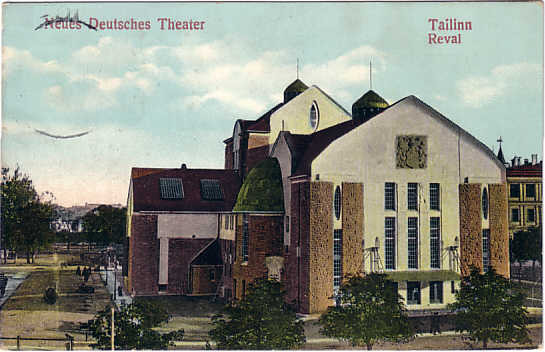 Front Text: "Neues Deutsches Theater Tailinn Reval"
Front Text: "Reval - Deutsches Theater"